This week I’ll be speaking with creative entrepreneur Tara Agacayak on a panel about social media for the International Professional Women of Istanbul Network (IPWIN). The happy trends of Web 2.0 online networking, collaborating, and user-generated content seem tailor-made for pro women like us who often face a more difficult career path abroad. Whether “trailing spouses” lacking a local work permit like Jo Parfitt recounts here or in some other way being at a geographic or cultural disadvantage is a common expat woman experience. So, as social networking renders overseas women like us visible and relevant, it’s a powerful tool of self-actualization. Our presence online becomes an advance calling card in life and work. We’re driven to fine-tune who we say we are, and how we behave, and where we appear online and who we choose to interact with, who our target audience is and how we do business. If we commit to social media, we evolve. How has social media launched you? Growing up in a countercultural town, the presentation and packaging tactics of Madison Avenue and Hollywood, and the protocol of the diplomatic world seemed like subversive tools of the establishment. I often think of a brilliant local character known as a founding father of California’s rich architectural history who wandered the streets of Berkeley barefoot, his red beard and hair wild, beer belly protruding from a ripped t-shirt. Where might his speaking career — and wind of Berkeley’s astounding architectural heritage — have taken him, if he hadn’t appeared to be a vagrant? Recently marketing futurist Seth Godin talked about the decisive role of cultural wisdom — or sophistication — in business, and asked why we don’t take it more seriously. I polled my online contacts, asking Is poor presentation a death sentence for a good idea? LinkedIn said yes (66%), to be successful an idea demands professionalism. “Presentation is EVERYTHING!” effused one person. Facebook was split, debating what professionalism means and the harm of over-marketing, with craftspeople and small business owners shouting “Hell no!” Commitment ranked as the top factor in success. One pragmatic man observed “Professionalism works in dull markets,” while a fellow Berkeleyan admitted we have to ”be able to engage with the status quo enough to be able to transmit a new concept.” Here at WordPress, 50% thought if the idea was winning people would forgive a shaggy package and one respondent likened presentation to the booster rocket that gets the Space Shuttle in to orbit. Is superficial accessibility superficial? Or are movements we think of as “fringe” on the periphery not just because their beliefs are minorly held, but because they refuse to persuade from within general convention? The fresh perspective of an outsider-on-the-inside releases energy from all directions. What strikes us about a place — and may entice our fellow country-people – often does not resonate to the same degree with the average native. I was pleased to meet an expat woman entrepreneur on LinkedIn last week who was once a director at the American-Malaysian Chamber of Commerce. She now advises the Malaysian Tourism Ministry, sourcing products developed by foreigners so I’ve been revisiting a feverish amusement from a decade ago when I lived in Kuala Lumpur. To enjoy the Newly Industrialized Country where hand-woven palm frond baskets were fast being replaced by pink plastic bags, I conceived a signature line of Southeast Asian travel mementoes, and a database of purveyors of exotic experiences like this on the island of Langkawi, on the island of Penang, and outside Kuala Lumpur. 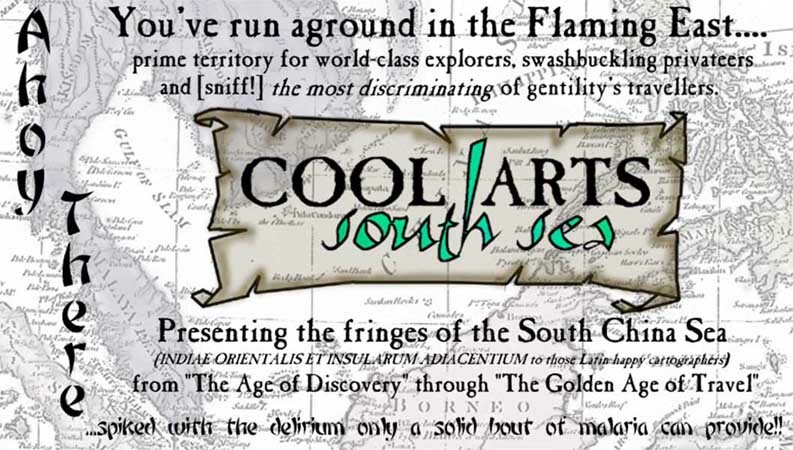 I called the venture first Cool Arts South Sea and then Flaming East. Inspired by history but not tethered to it, my Flaming East concept embraced the original wonder of the region’s watery crossroads, from the Renaissance’s Age of Discovery (with its empire-building and search for trade-routes) to the steamer trunks-and-servants Golden Age of Travel. All spiked with the delirium only a good bout of malaria could provide…. To be honest, Southeast Asia’s enveloping assault on the senses continued. But colorful naiveté and uncensored awe were in short supply where I came from. Writing about the past of the place caused my politically-correct, Pacific Northwest spellchecker to protest. I was flaming the East! Didn’t I really mean “cinnamon” when I typed “Chinaman”? Have you envisioned a tourism campaign, service or product for a locale where you’re the outsider-on-the-inside? What does it show about the place, and you?